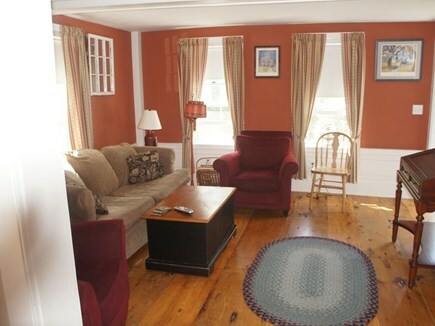 Meticulously restored antique Cape in charming Pond Village Historic District with parking for two cars. Walk just 3/10 mile to Cold Storage Beach on the Bay, the post office, a little market, cafe, library, restaurant, two churches, and the bus stop to catch a shuttle bus to Provincetown every 20 minutes. Behind the house, watch goldfish swim in a fish pond and birds alight on fruit trees and flowers as you sit in the shade and have coffee in the morning. 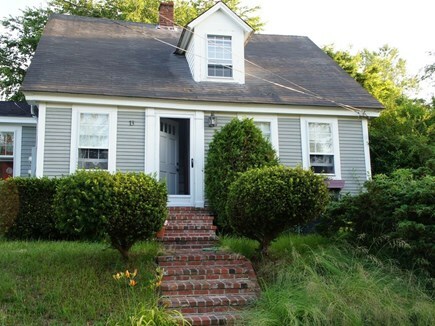 There is a fully equipped kitchen, dining table, bathroom, and living room on the first floor. Also one bedroom with a single bed, not a double, and a pullout sofa that sleeps two. On the second floor, there is a master bedroom with a queen bed, a bathroom with a Jacuzzi, and a smaller bedroom with a single not a double bed. 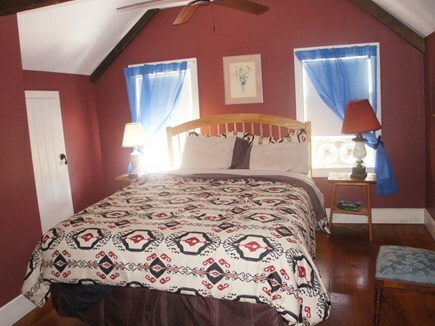 Antique, wide pine floorboards, new bedding and furniture. Jacuzzi tub, Corian countertops in the kitchen, Jenn-Air gas cook-top, electric wall oven. Hand-crafted cherry dining table, and a deck with patio furniture for outdoor dining. Indoor and outdoor showers.